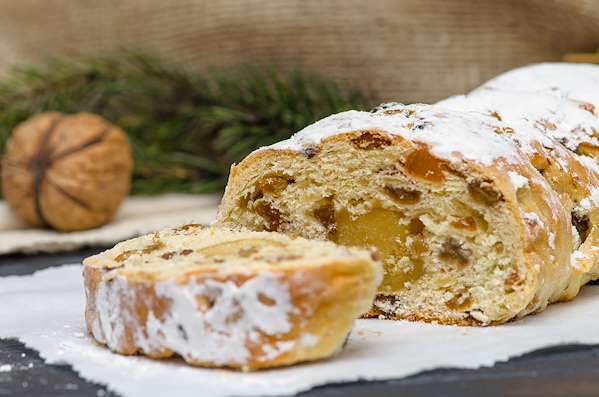 RecipeSavants.com Bring a touch of Old World Christmas charm to your holiday table with a traditional German stollen. 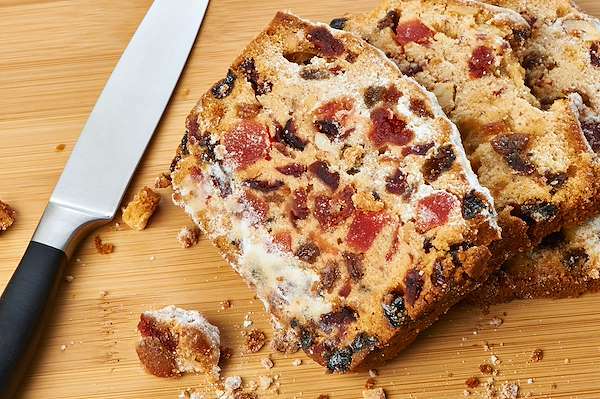 These buttery, moist loaves are loaded with rum-soaked fruit, crunchy almonds and a delightful almond paste filling. Stollens can be baked in advance and make thoughtful holiday gifts. 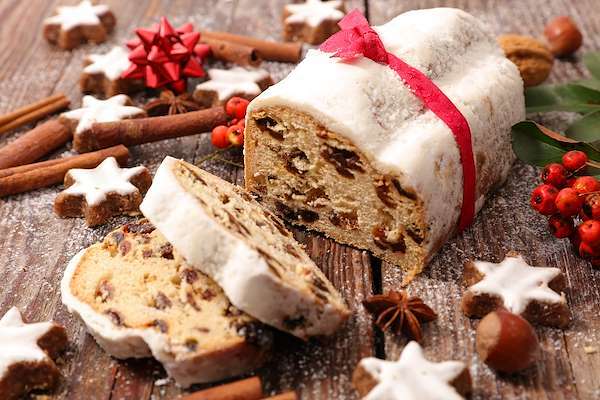 Smart Recipes, European Recipes, Vegetables,Nuts Recipes, Recipes Vegetables,Nuts European Christmas Stollen PT3H Serves 12 Ingredients: 1 Tablespoon Instant Yeast 0.75 Cup Warm Water 1 Large Egg 0.5 Cup Unsalted Butter 0.25 Cup Powdered Milk 3.5 Cups Bread Flour 0.25 Cup Granulated Sugar 1 Teaspoon Salt 0.5 Teaspoon Ground Mace 0.5 Teaspoon Ground Cardamom 0.5 Tablespoon Fresh Lemon Zest 1 Cup Toasted Almonds 0.75 Cup Almond Paste 1 Cup Golden Raisins 0.5 Cup Dried Citron 0.5 Cup Dried Cranberries 0.5 Cup Dried Currants 1 Cup Dried Apricots 0.5 Cup Light Rum 2 Tablespoons Butter 1 Cup Powdered Sugar In a medium bowl, combine the dried fruits and rum (or orange juice). Cover bowl with plastic wrap and set aside at room temperature for up to 12 hours, or overnight. In a stand mixer with a dough hook, add yeast, water, egg, butter, dry milk, flour, sugar, salt, mace, cardamom & zest. Blend into a soft, smooth dough. Remove bowl from mixer and cover with plastic wrap. Let the dough rise in a warm place until puffed up, about 60-90 minutes. Meanwhile, divide the almond paste into three pieces. On a floured surface, roll each piece into a log about 7 inches long. Add soaked fruit and nuts to the dough and knead until well incorporated. Turn the dough out onto a lightly floured surface and divide into 3 even pieces. Roll each piece into an oval about 8 inches X 6 inches. Place the log of almond paste down the center of each oval and fold dough over it lengthwise, leaving the top edge of the dough close to the bottom edge. Press the top edge firmly to seal the dough. On a sheet pan lined with Silpat or parchment paper, arrange the loaves and cover them with a kitchen towel. Let them rise in a warm place until puffy, about 45-60 minutes. Meanwhile, place oven rack in the upper- third of the oven and preheat to 350 degrees. Bake the stollen until golden brown and its internal temperature reads 190 degrees on a digital thermometer, about 30-35 minutes. Remove from the oven and brush with melted butter. After about 5 minutes, dust each loaf generously with powdered sugar. Transfer loaves to a wire rack to completely cool. Wrap tightly in plastic wrap and store at room temperature for up to 2 weeks.